Hobbit production pic from Alan Lee. Peter Jackson has just sent out the first production by Alan Lee and John Howe from the (first) movie of The Hobbit. Still sounds odd to say first. 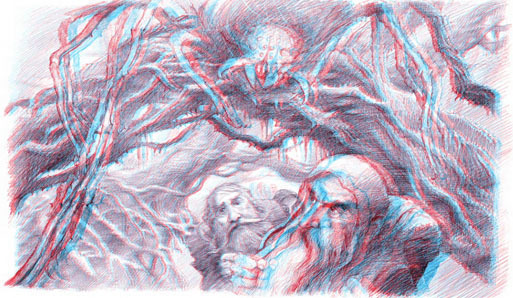 The twist is that the illustration is in 3D, so dig those cinema glasses out of your wardrobe. The last time I needed my 3D specs was to watch The Green Hornet in London, along with comic-book creator Mike Carey and author/movie producer Philip Palmer. I keep mine in the kitchen drawer (the glasses, not my drinking buddies). « Bane of my life!